Every now and then, the Husband gets to head off, after a long day working, to a business dinner. A dinner with grown ups … at a grown up restaurant … with grown up conversation … and grown up table manners. I’m left at home trying to convince Mr. Boy that boogers are NOT a part of a well balanced diet, listening to the Little Lady yodel while in the bathroom (seriously, why is bathroom time music time? Anyone else have kids that do that? Sigh), and trying to avoid the spray of food spewing form Baby Barney’s mouth…. he’s learning new tricks and thinks it’s fun to practice during dinner time. A dinner with grown ups? A fantasy in my world. About a month ago, after such a dinner, the Husband waltzed in — kindly ignoring dinner dishes that were still on the table — and walked over to me. I was splayed out on the couch, recovering from feeding, bathing and slapping every kid in their respective bed. I had the best bread pudding I’ve ever eaten tonight. I was was dumbfounded. (1) Food is more important than even a simple “Hello?”, and (2) what happened to MY bread pudding being the best ever? He tried to backtrack, realizing the dangerous territory he was in, but it was too late … and he knew it. He was at my mercy. I had two choices: (1) dump the left-over pureed baby food on his head or (2) take up the challenge of reinventing my classic bread pudding. I went with option number two… and created a new bread pudding that broke my “cardinal” bread pudding rule: the no-fruit rule. This extra-ordinary bread pudding of the Husband’s? It had applesauce in it. 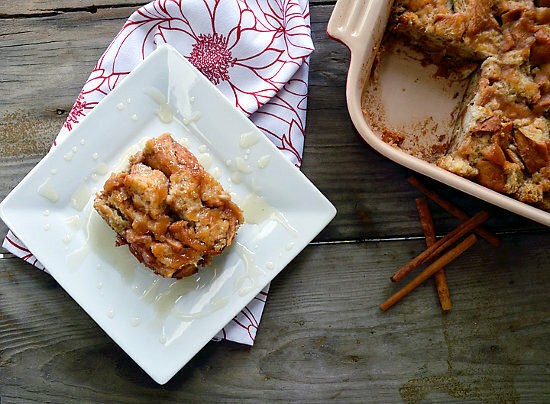 I couldn’t ignore the apple “essence” my husband loved in this dessert, no matter how strongly I believed fruit and bread pudding should never mix. So, I took advice from my foodie mother, made a few quarts of applesauce and got down to the nitty gritty business of baking. Finally… I pulled a steaming hot pan out of the oven. Without waiting for it to cool, I cut a large square of my new bread pudding and served it to the Husband …. along with a few spoonfuls of a glossy caramel-whiskey sauce drizzled over the dessert. I don’t think the boy bothered to come up for air as he ate and ate and ate, scrapping every last crumb and drop and forking them into his mouth. The Verdict: I won. 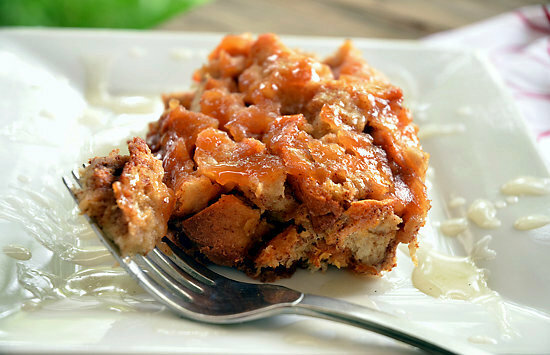 And, after tasting it too, I realized adding fruit to bread pudding wasn’t such a bad thing after all. No, it was a very GOOD thing. Oh, holy apple goodness! With a few substitutions, traditional bread pudding becomes a gluten and lactose free desert for those who need to avoid these allergens. 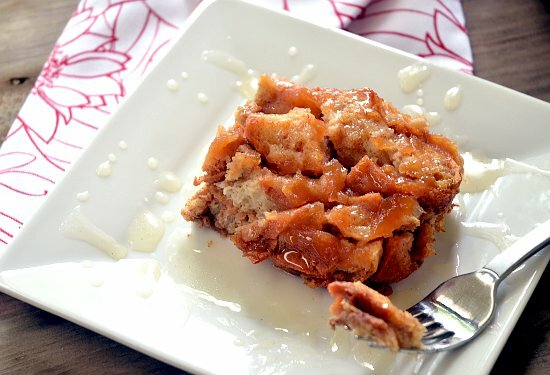 Unsweetened applesauce brings the perfect apple essence without radically changing the texture of traditional bread pudding. In a large mixing bowl, whisk together the applesauce (minus the reserved 3 tablespoons) and the almond milk. Add the beaten eggs and whisk to incorporate. Blend in the sugar and cinnamon. Add the cubed bagels (approx. 5 cups) to the liquid mixture and let it set, allowing the bread to soak up the liquid. When the majority of the liquid has been absorbed by the bread, pour everything to an 8×8 (ungreased) pan. Spread the reserved applesauce over the top of the bread pudding. Place in the oven and bake 30-40 minutes, or until the pudding is set and a knife comes out mostly clean (it will have some trace applesauce from the topping). *I used Udi brand bagels, which are found in your freezer section. I chose them because, in terms of texture, they were the closest to a crusty challah or french bread, which are my normal breads for bread pudding. **If dairy is not an issue, heavy whipping cream is DELICIOUS as an additional sauce, poured over the top of the bread pudding/hard sauce. Trust me — really, really good. The addition of whiskey is what makes this a “hard” caramel sauce. Don’t worry — the alcohol cooks off! Over medium low heat, melt the butter. When melted, raise the stove temperature to medium high and then stir in the sugar and water, stirring constantly. When the sugar has dissolved, continue stirring while carefully pouring in 2 to 4 tablespoons of whiskey. Be careful — the whiskey will instantly begin to boil, cooking off the alcohol. Continue boiling and stirring for an additional 5 minutes. Remove from heat and allow to cool at least 10 minutes. Sauce will thicken as it cools. To store, keep it refrigerated in an air-tight container. May be reheated. * More or less of the Whiskey can be added, but there is more depth of flavor with more! If you aren’t a whiskey fan, bourbon or even butter schnaps (my personal favorite to go with bread pudding) can be used. If you want to abstain altogether, use a good vanilla extract or paste. So why the Gluten Free aspect of this bread pudding? This recipe actually answered TWO challenges — my Husband’s and a challenge from the folks at Udi Gluten Free. Right now, Udi is having a “Look Again – It’s Gluten Free” Recipe Contest on their Facebook page. You can enter or browse the gluten-free recipes submitted by others. For even more GF tips and recipes, visit the Udi’s Gluten Free Living Community. I loved combining new flavors and gluten free ingredients to create this delicious recipe. Now I’m curious to know, what do you enjoy most about trying something new? This is a sponsored conversation written by me on behalf of Udi’s Gluten Free. The opinions and text are all mine. Official BlogFrog Sweepstakes Rules.